With regular hammered satin being so intensely thin, I came into this 300 bottle 1 pp minx with extremely circumspect reservations. As expected, this is Ashley Olson thin, little substance to the mouthfeel, and not much staying power. Notwithstanding, the depth of the taste almost entirely remedies the viscosity shortcomings. There’s a tasty roast with a chocolate residual sweetness like an Oreo cookie dunked in espresso. This is like a more formidable Velvet Merkin meets a less substantial cw15/16/17. 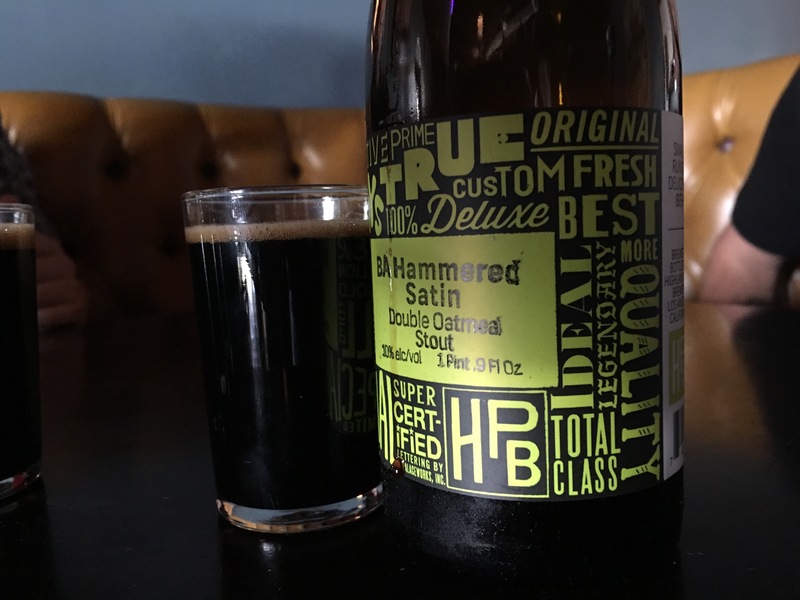 If you prefer your pat stouts in a clean, high volume of consumption rate: you’ll love this. It has great barrel presence without the long drag in the swallow. If you have ever dunked an E.L. Fudge into chocolate milk, you know this feel. The affair is a throwback to the Czar Jack and Stormskatporter realm, which I fully expect the residual sugar meat beaters to eschew. While HPb still isn’t a darling in the big beer realm, every step brings Bob and Ross closer to the winner’s circle I hope they will attain.